Recently, I attended a stargazing gathering at the home of our local Night Sky expert, Darlene Danko, who writes a weekly column by that title for our local newspaper. It’s one of the first columns I read. Last week, Ms. Danko set up her computerized telescope in her front yard and invited the neighbors to join her. It was fascinating to see craters on the moon and rings on Saturn up close. We saw lots of other stars and galaxies, but the moon and Saturn were the best. For the next few nights, all of us will have the opportunity to see a full moon without such a fancy telescope. The moon will be coming up at dusk or nightfall for several nights in succession, a progression of moonlit nights that characterizes the harvest moon. The term harvest moon probably came from farmers who used the extra moonlight during fall harvest. 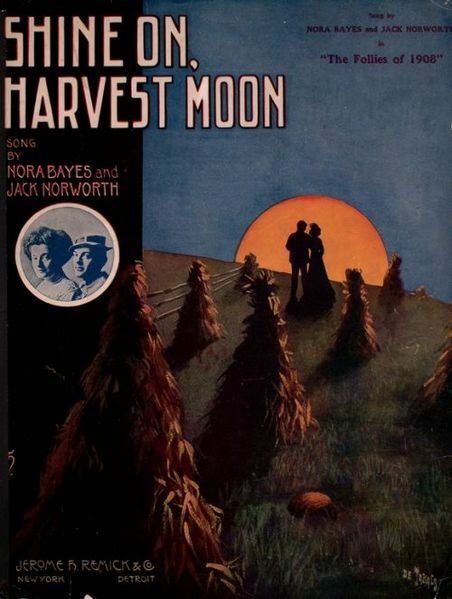 Then in 1903, Nora Bayes and Jack Norworth popularized the name in the popular song Shine On Harvest Moon. The old sheet music cover (and words) warm my romantic heart. And, this year the Harvest Moon is a bit bigger than usual … because it’s also a supermoon. 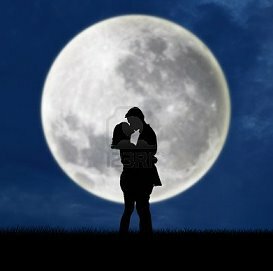 Astrologer Richard Nolle came up with the popular name supermoon to describe a new or full moon which occurs with the moon at or near (within 90% of) its closest approach to Earth in a given orbit. Technically the phenomenon is a perigee full moon, or a perigee new moon. Whatever you call it – harvest moon or supermoon, I’m just going outside tonight and enjoy the bright, orange orb. Maybe do some spooning on the porch with my honey.